What is your glory? Do you glory in your accomplishments, your wealth, your status, your looks, your piety, your humility ...? In the old hymn "Beneath the Cross of Jesus," we confess, "My glory, all the Cross." That's what Christians mean when we "glory in God's holy name." Our full understanding of God's holy name has been greatly expanded by Jesus. He taught us to not only reverence the name of God, but also to call him Father. Any other cause of joy, any other basis for boasting, is a passing illusion. 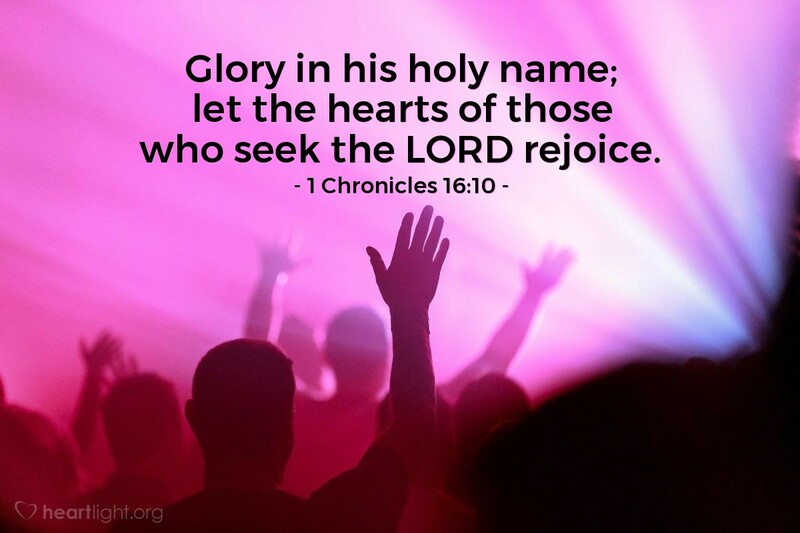 For those whose hearts seek the LORD, glory is found in reverencing the holy name of the Father who gave up his precious Son so we could be his children. He loves us that much. Incredible! You have blessed me in so many ways, Father. How can I ever begin to thank you properly? I confess that I sometimes seek notoriety and glory for myself even though I know it is fleeting and often it is only the false flattery of those who want something from me. But deep in my heart, dear God, I know that my true glory is found in the adoption covenant you signed with your grace. Thank you! Words cannot capture my appreciation, but please know that I look forward to being eternally grateful for all that you have done. May the glory be yours in heaven and throughout the earth, both now and forevermore. In the name of Jesus I praise you. Amen.